Combine ingredients in a bowl and whisk together to blend well. Pour into a plastic zip lock and add ribs. Refrigerate overnight, turning as needed to coat ribs evenly. Prepare barbeque (med.-high). Remove ribs and discard marinade. Grill ribs until cooked to med.-rare, about 5-8 minutes per side. 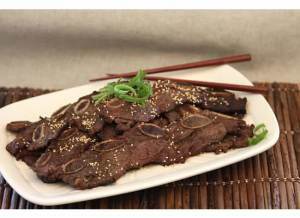 Mound ribs on platter and garnish with chopped green onions and toasted sesame seeds. Serves 4.